Spasticity, in which the leg and arm muscles are very tight and contract very strongly when the child attempts any stretching movement. Spastic muscles often become shorter as the child grows older, resulting in limb deformities. Athetosis, in which the muscles move involuntarily and uncontrollably. The child can attempt to make a purposeful movement, but it often becomes distorted. Tremor, in which the arms and legs shake. Continuous tremors are rare—tremor usually only occurs when the child tries to use her limbs. Ataxia, in which balance is poor. The child walks with an unsteady gait, holding her legs and arms apart to help bal­ance herself. An ataxic child often falls over. Estimates suggest that approximately one child in four hun­dred has cerebral palsy. All forms of cerebral palsy are caused by specific damage to part of the brain. This can occur in the womb (such as when a mother becomes infected by German measles early in the pregnancy), during the birth process itself (when a baby is denied oxygen for a short time during labor), or after birth (possibly as a result of meningitis). The specific form of cerebral palsy depends on which part of the brain is affected and how widespread the damage is. Cerebral palsy is a nonprogressive (nonworsening) condition. The brain damage that affects the child’s motor coordina­tion frequently affects other body mechanisms as well. 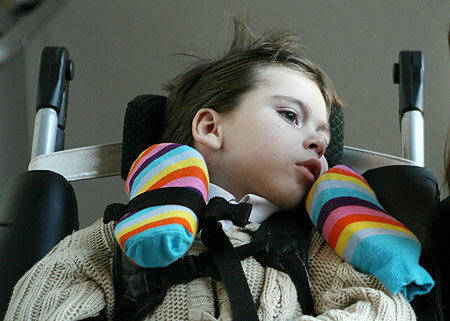 A child with cerebral palsy may have difficulty swallowing. Nearly half of all children with cerebral palsy have some form of speech dif­ficulty. Hearing and visual defects may occur, and in some instances of spasticity, the child may experience convulsions. Unless the condition is extreme, diagnosis of cerebral palsy rarely takes place at birth. Several days or weeks may pass before the baby’s mother and father begin to sense that their baby does not move her limbs in the ways that she should. Although there is no cure for the condition, the earlier it is diagnosed the bet­ter, since proper management of the child in the preschool years can make a significant difference in the way she manages her motor-coordination difficulties. 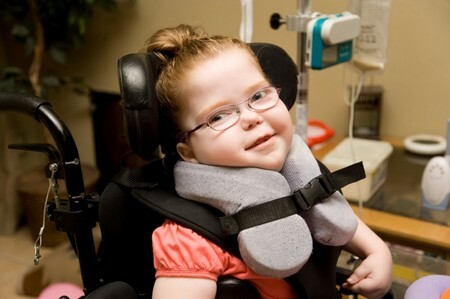 Once a child is identified as having cerebral palsy, a number of therapies—physiotherapy, occupational therapy, and speech therapy—will be made available to her if required. In every instance, the therapist will be actively involved with the child, and will give parents advice on activities suitable for the child at home. An occupational therapist may also arrange for the child to be supplied with specific aids, to enable her to sit at a table, to walk, and to eat independently. Surveys indicate that at least 50 percent of children with cerebral palsy have learning difficulties, and there is a higher incidence of severe learning difficulties among such children than there is among the gen­eral population. However, this does not mean that every child with cerebral palsy will inevitably be a slow learner. Each child must be treated individually, since the child’s rate of develop­ment depends on the degree of brain damage. A child with cerebral palsy should be encouraged to lead as normal, and as independent, a life as possible. This should begin in the preschool years. Encourage your child to cope with her coordination problems so that she can play with other chil­dren of her own age. While some children with cerebral palsy are so severely affected in their motor coordination, their intel­lectual development, and their speech that they require special­ized schooling, many children with this condition can attend an integrated school. In recent years, conductive education has become increas­ingly popular. This treatment aims at promoting the all-around development of a child with cerebral palsy. It combines physio­therapy, occupational therapy, and speech therapy in a multi-faceted approach. Conductive education prepares a child with cerebral palsy for school by developing her thought processes, language, com­munication, mobility, and hand control. This training can enable a child to participate more fully in the education offered in an integrated classroom. Advocates of this system claim that children are not taught how to use a wheelchair—they are taught to walk. They are not taught how to manage their incon­tinence—they are taught to be continent. They are not taught alternative means of communication because of their speech difficulties—they are taught to speak. How to Render Your Dormitory Room?